Endeavour is receiving numerous visitors and support equipment during her Californian vacation, as post flight deservicing continues to ramp up towards a Sunday flight home to the Kennedy Space Center (KSC). The orbiter and SCA (Shuttle Carrier Aircraft) duo are expected back in Florida in the middle of next week, following the cross-country trip. Processing is currently down by over half a day, following a power outage at the Mate/Demate Facility. An incident – which involved a crane contacting one of Endeavour’s Orbital Maneuvering System Pods – is also being investigated. “Power returned at 1631 EST Monday. Approx 1.5 shifts down with power loss. Orbiter is on jacks and levelled. White room is in position and hatch is open,” noted the latest processing information on L2. “Unexpected vehicle power loss when both ground power supplies failed during cooling reconfiguration after fuel cells were powered down. The vehicle was reconfigured and safed. “Suspect a poor power supply AC contactor connection that resulted in a power overload. After the ground power supply was brought back up, powered cycled several times and left to run for several hours, the vehicle was successfully powered back up using the same supply. Ground Operations engineers – known as the B-Team – were flown out to support Endeavour’s deservicing operations, ahead of her SCA flight out of California this coming weekend – along with 10,000 lbs of equipment, which was flown out on a C-130 transport aircraft. Turning Endeavour around as soon as possible will allow for the “Leonardo” Multi-Purpose Logistics Module (MPLM) to be removed and re-processed for its next flight – currently TBA due to another expected manifest re-alignment in the near future. Several high profile shuttle managers are also flying out to greet Endeavour, including Mission Management Team (MMT) chair Leroy Cain. They are expected to be on site for the Ferry Flight Readiness Review (FRR), which is due to take place at the weekend. That praise is fully justified, with additional reports on the health of the orbiter continuing to point towards an extremely clean flight of Endeavour. However, engineering perfection always manages to find faults – in this case with a flow control valve. “The runway report looked pretty good; the tiles are pretty clean. There were only five areas with damage greater than an inch,” added the Orbiter Project Office. “The window ding looked about the same as it did on orbit; no signs of propagation. That matched what the windows guys had told us. “The biggest turnaround issue, on what might affect the next flow, is the flow control valve. Because we landed at EDW, they won’t get a chance to look at that and do the X-rays until it gets back to KSC. “On Window 6, didn’t see any increase in the propagation in terms of cracks when we got back on the runway,” elaborated JSC’s Orbiter Project. 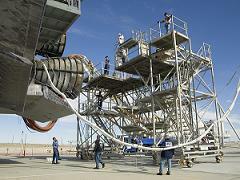 “Will look at some process improvements for STS-119. 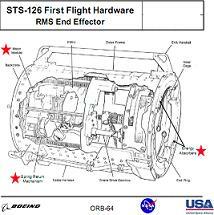 Several modifications flew with Endeavour – such as the new upgrade to the Remote Manipulator System (RMS) end-effector (noted in a SSP Flight Readiness Review presentation on L2) – which failed to gain a mention on orbit, mainly due to their issue-free operation. Now the mission is over, acknowledgement is starting to be noted. And despite the upcoming Christmas/New Year holiday, the pace won’t be letting up, with Discovery due to rollover to the Vehicle Assembly Building (VAB) in just over a month’s time. This was referenced by Orbiter manager Steve Stich. “Even though we just landed a long mission that spanned three weekends, we have a lot on our plate this week with some key decisions at the PRCB (Program Requirements Control Board),” Mr Stich noted.